It’s almost that time of year. Grilling season. Well technically, the weather has been so nice lately that some of you may have been grilling already. 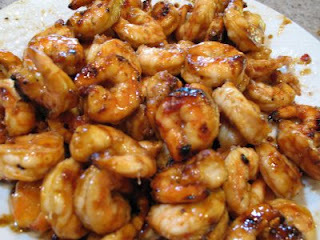 Some of you may have indoor grills (I definitely need one) Shrimp is a fabulous food to grill. Small, perfect for skewers and tons of flavor! You know how much I like a little heat in a lot of my food and this is just the right amount of kick! You can always add a little more kick! 2-2 1/2 lb. raw, shelled, de-veined shrimp. (Tiger Shrimp are great). Rinse shrimp in cold water and place in a large Ziploc bag. Combine garlic, ginger, both chili pastes, honey, lime juice, salt, pepper, and oil in a large bowl. Whisk thoroughly. Set aside 1 cup of the marinade. Pour remaining mixture over shrimp and refrigerate for at least 24 hours and up to 48 hours. Preheat outdoor grill. This should really should be done outside because they get VERY smokey! When grill is hot, reduce heat to low and quickly place all skewers over the heat. Brush with reserved marinade. When they’ve cooked for 1 1/2-2 minutes, quickly flip them over and brush or drizzle with remaining marinade. Cook for another 1 1/2-2 minutes, or until opaque and pink. Remember, shrimp cook QUICKLY. You want to be careful not to overcook them. Remove skewers from grill and remove shrimp from skewers. Pile them on a plate, drizzle with any remaining reserved marinade, and squeeze the juice from a lime all over them. Serve with rice or french fries any of your other favorite sides! If these do not scream Cinco de Mayo I don’t know what does! Pinterest has yet again shown me an interesting recipe that I can easily make gluten free and dairy free and still delicious! When you think of Cinco de Mayo you think tequila yes. Margaritas? Of course! But cookies?! Whoa wait a minute! 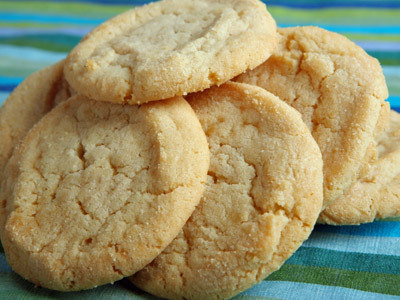 Well these tequila cookies are the ultimate Cinco de Mayo fiesta treat! They are sugar cookies with a KICK! Put the butter in the bowl of a mixer fitted with the paddle attachment and beat at medium speed until it is smooth. Add the sifted confectioners’ sugar and beat again until the mixture is smooth and silky. Beat in 1 of the egg yolks, followed by the salt, tequila, grated lime zest, and orange zest. 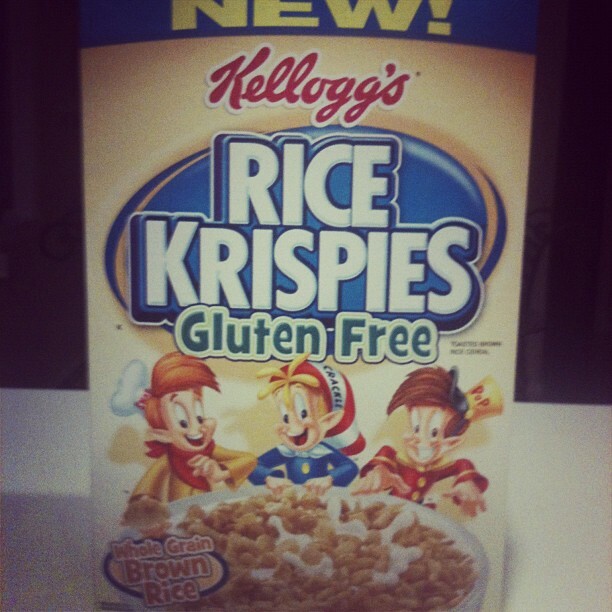 Reduce the mixer speed to low and add the gluten free flour, beating just until it disappears. It is better to under beat than over beat at this point; if the flour isn’t fully incorporated, that’s ok — just blend in whatever remaining flour needs blending with a rubber spatula. Turn the dough out onto a counter, gather it into a ball, and divide it in half. Wrap each piece of dough in plastic wrap and refrigerate for about 30 minutes. Position the racks to divide the oven into thirds and preheat the oven to 350°F. Line two baking sheets with parchment paper. While the oven is preheating, work on the sugar coating: Whisk the remaining egg yolk in a small bowl until it is smooth and liquid enough to use as a glaze. Spread the coating sugar on a piece of wax paper. 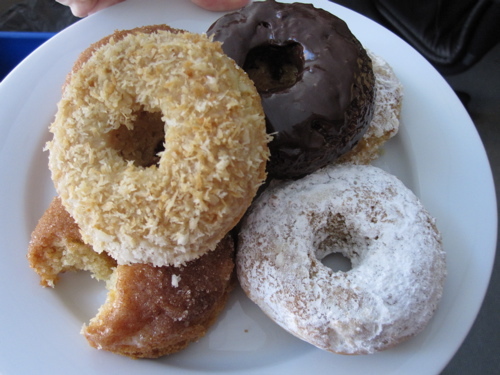 Remove the logs of dough from the refrigerator, unwrap them, and brush them lightly with a little egg yolk. Roll the logs in the sugar, pressing the sugar gently to get it to stick if necessary, then, using a sharp slender knife, slice each log into cookies about 1/4 inch thick. Place the cookies on the lined baking sheets, leaving about 1/2 inch space between them. ¡Hola! ¡Feliz Cinco de Mayo! I love spanish cuisine! 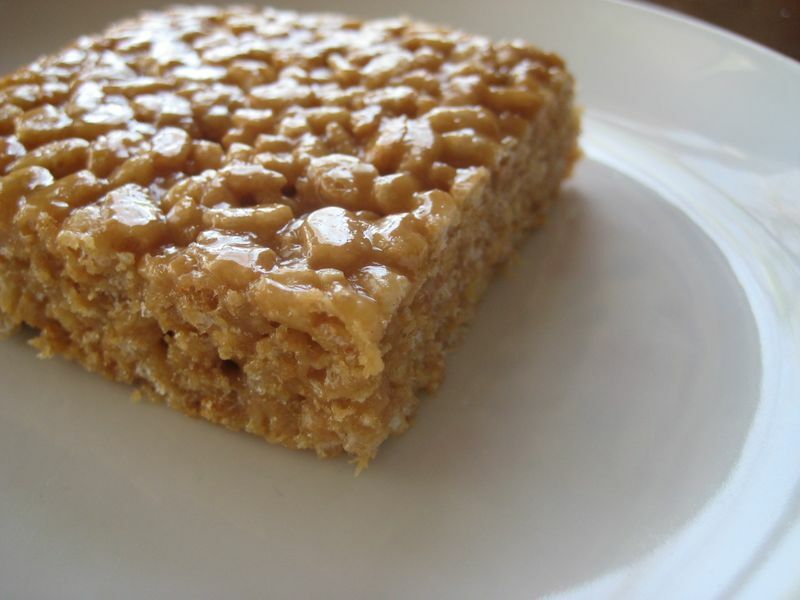 So today, how could I not post some delicious recipes! 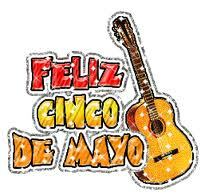 Cinco de Mayo is a perfect day to enjoy Mexican food, drinks and music. Did you know that Cinco de Mayo is observed in the United States as a celebration of Mexican heritage and pride,and to commemorate the cause of freedom and democracy during the first years of the American Civil War. But, contrary to widespread popular belief, Cinco de Mayo is not Mexico’s Independence Day—the most important national patriotic holiday in Mexico—which is actually celebrated on September 16. Now you know! Ok let’s dive right in. I was watching Food Network recently (I watch Food Network a lot as you know) and Chef Aarón Sanchez (he’s wonderful, I want to met him) was talking about traditional Mexican dishes and he mentioned carnitas. Carnitas, which literally means “little meats,” is a type of braised or roasted (often after first being fried) pork in Mexican cuisine. Sooooo yummy! So here is a delicious and simple carnitas recipes served as a little taco! This recipe takes a while! But it is worth it in the end! Serve with plantain chips, and your favorite Cinco de Mayo drink! In a large, heavy saucepan over medium-high heat, combine pork, broth, and salsa. Add enough water to completely cover the meat. Cover and bring to a boil. Reduce heat to low and simmer, covered for 3 to 4 hours (or longer) until meat pulls apart easily. Add salt to taste. You want your meat to taste good! That’s the most important part of the dish! Preheat oven to 400ºF. Remove meat from liquid in pot (discard the liquid) and spread the meat out in a roasting pan. Break the meat into small chunks. Roast meat for 15 to 20 minutes until brown and crispy. Heat the tortillas one-by-one either in a a hot skillet. Use a little butter or oil to help soften them. When air pockets form in the tortillas they are ready. Keep warm tortillas wrapped in a clean cloth towel for serving. Dress your lettuce by lightly salting it and sprinkling it with vinegar. Set aside. To serve, double up the tortillas and place a few spoonfuls of the carnitas on them. Top with salsa. Serve with grated lettuce. 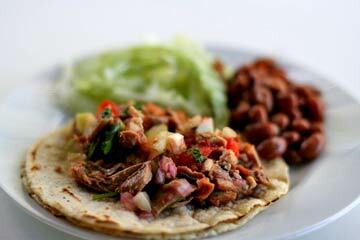 To eat, remove half of the carnitas from one tortilla to another. Take one tortilla at a time with the carnitas and salsa, fold it over and enjoy. Or, keep them doubled up. You can also serve the carnitas with beans, or grated cheese. Your choice!